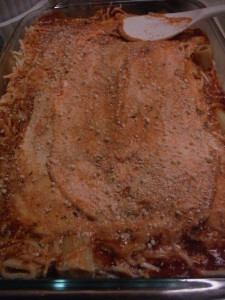 Every time my mom has a potluck at work or we need to prepare for an impromptu family gathering, this recipe is my go to because it is quick and easy. Let’s get to it: Gather your ingredients: ziti noodles, pasta sauce, olive oil, whole milk ricotta cheese, mozzarella cheese, parmesan cheese, and cheesy garlic bread – because what’s a nice plate of pasta without more carby deliciousness? 🙂 If you feel like getting really fancy, add some asiago cheese to the mix. It adds a nice bite because of it’s sharpness. Add water, olive oil, and salt to a large pot and bring to a boil over high heat. 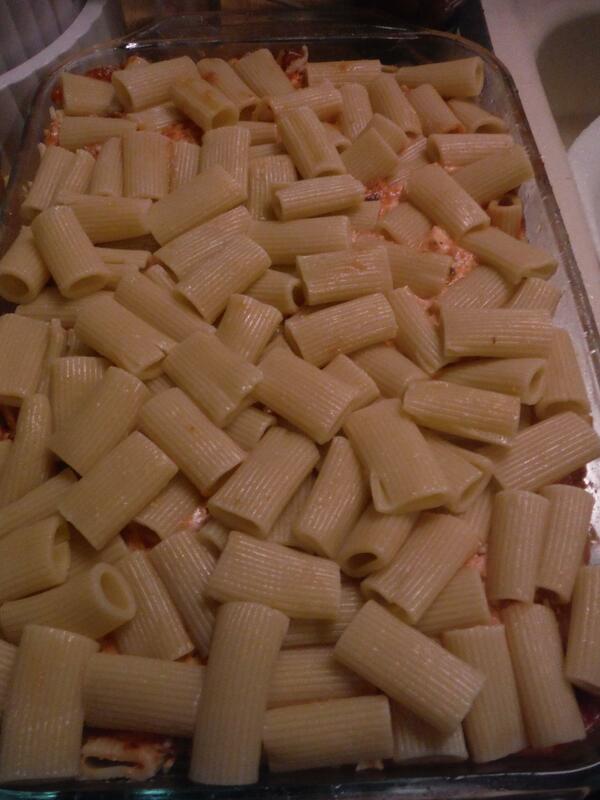 Cook your pasta, stirring occasionally, according to the box directions. 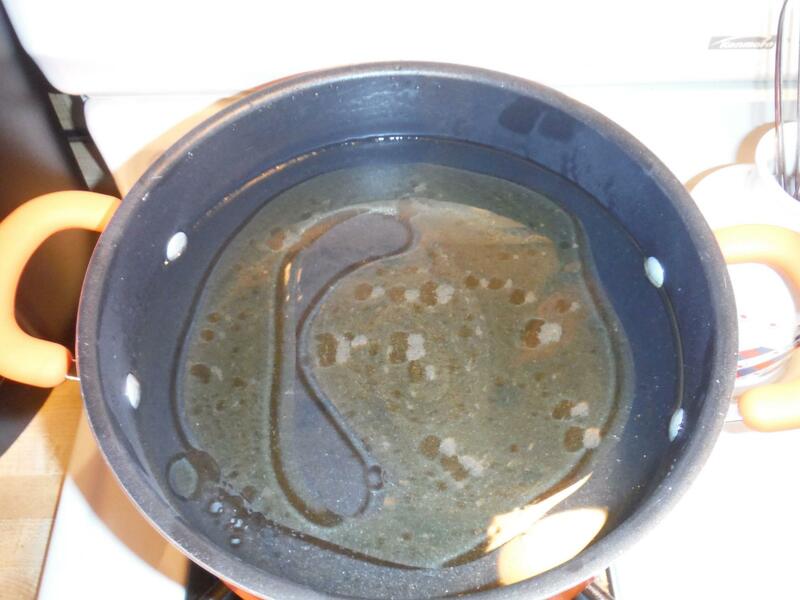 Drain pasta, and reserve one cup of the pasta water. 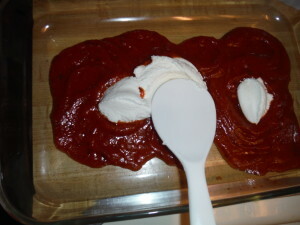 Combine the sauce and ricotta. Spread the mixture to coat the bottom of the pan. 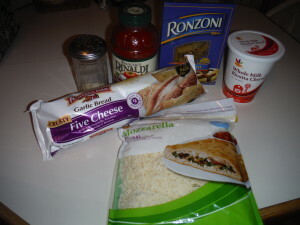 Sprinkle on the parmesan and/or asiago cheese. 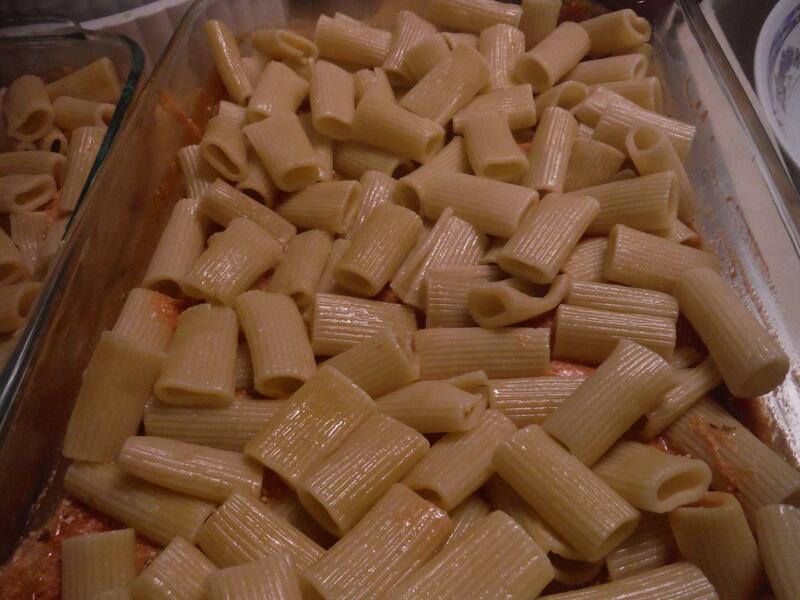 Add in half of your pasta. Cover liberally with the mozzarella cheese. I think you see where this is going! Making the ziti like a lasagna makes it flavorful and cheesy throughout! Add another layer of sauce. 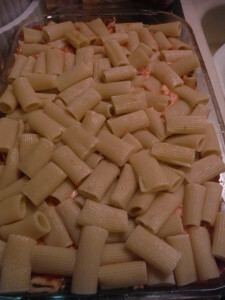 Combine with ricotta and spread over pasta evenly. Sprinkle with parmesan and/or asiago cheese. Add the remainder of your pasta. 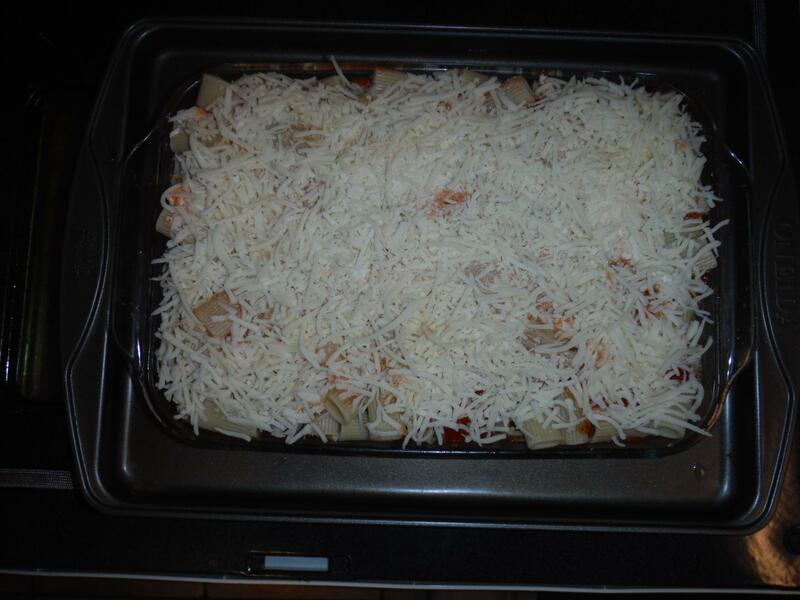 Cover the top with as much mozzarella cheese as you can fit. Sprinkle more parmesan and/or asiago if you’re feeling dangerous. Since you’ve shoveled an ungodly amount of cheese on top of your pasta, place the baking dish on a large baking sheet. 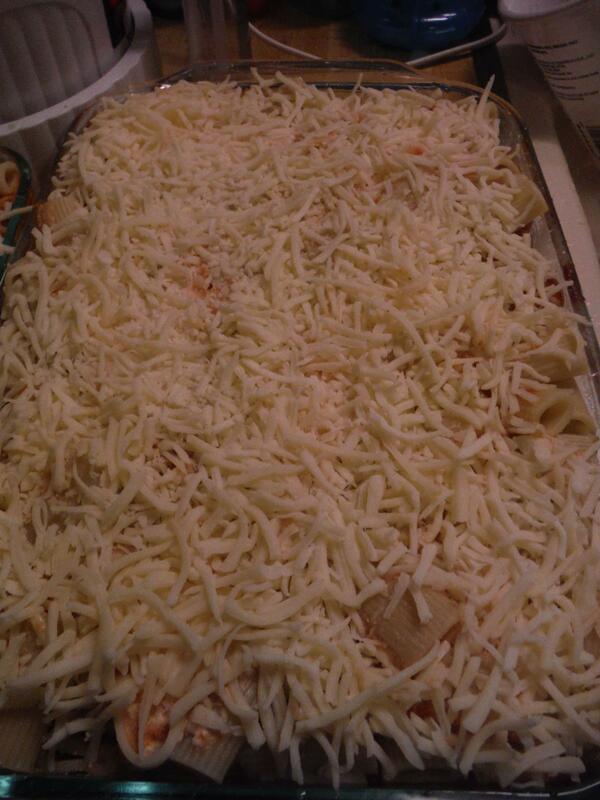 This will ensure you’re house doesn’t fill with smoke because the cheese bubbled over onto the bottom of the oven. Trust me, I speak from experience. 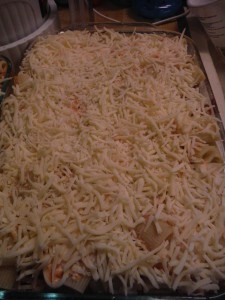 Let the pasta bake at 350 degrees for 40-60 minutes. 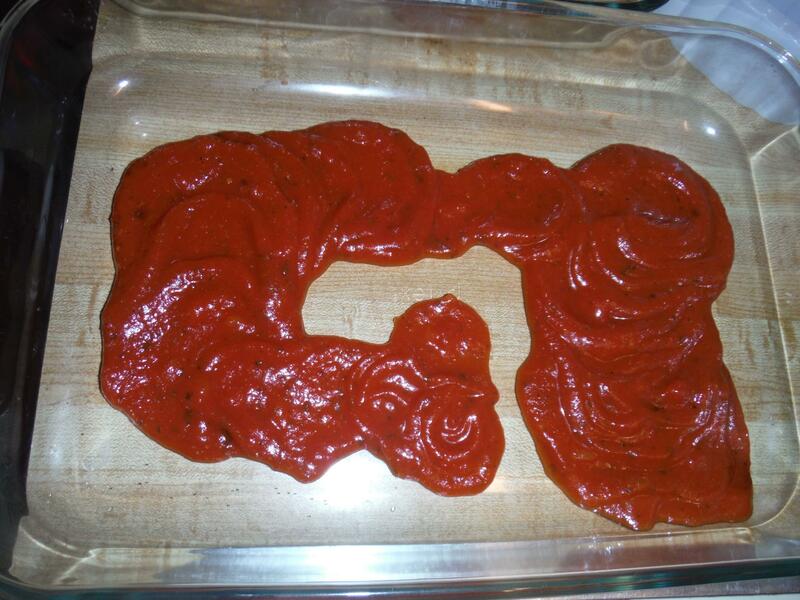 Here is the beautifully browned final product. I like my cheese to have a little crisp and crunch on top, so I leave it in for closer to an hour. Be sure to serve with cheesy garlic bread for proper sauce dunking. Enjoy! 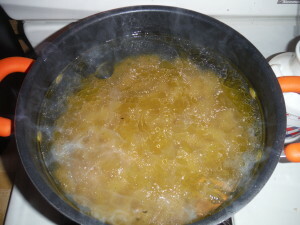 In a large pot, add water, olive oil, and salt. Bring to a boil over high heat. 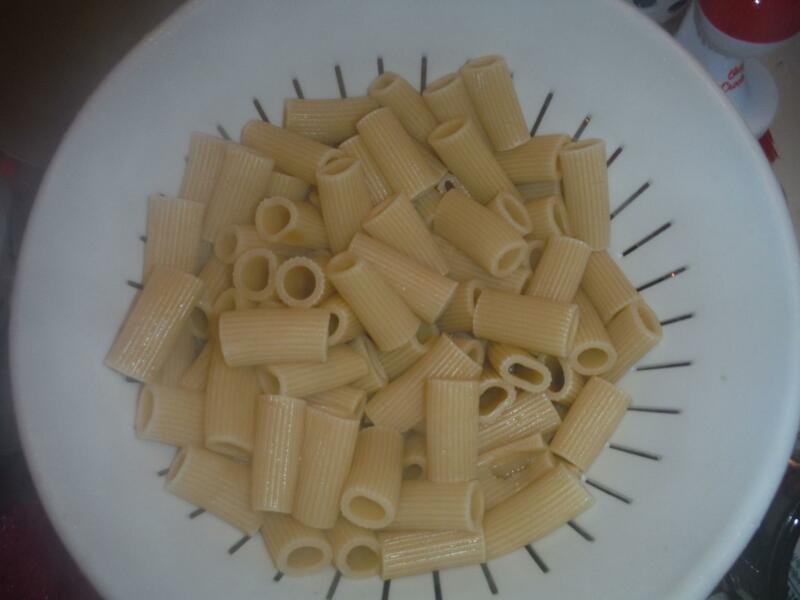 Once boiling, add pasta and cook according to box instructions. 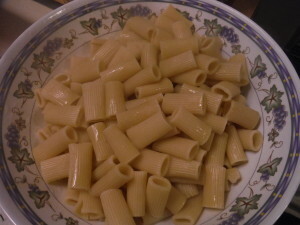 Drain pasta, reserving one cup of pasta water. Transfer pasta to a large bowl and combine with reserved water. Toss to coat. 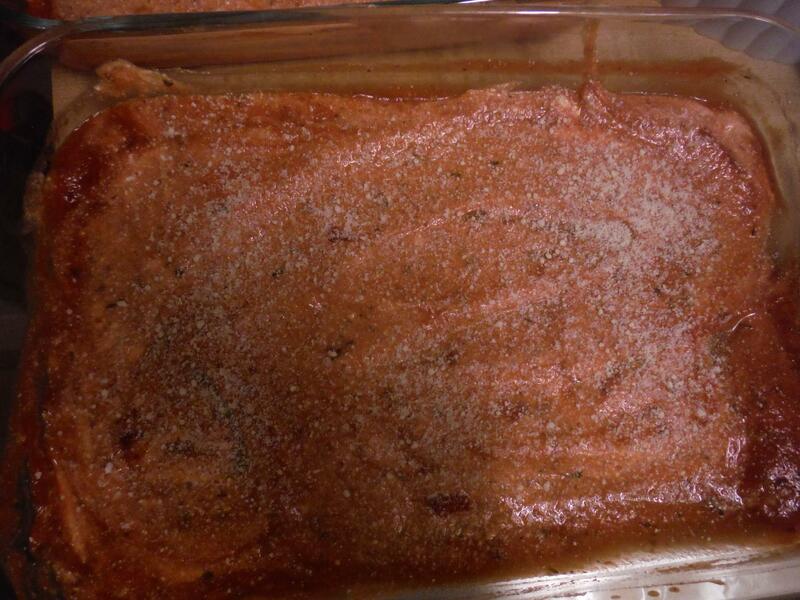 In a large baking dish, pour in some pasta sauce and spoon in some ricotta cheese. 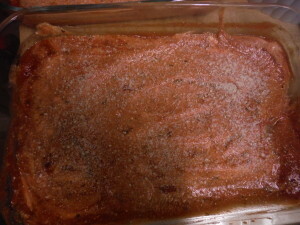 Stir to combine and coat the bottom of the baking dish. Sprinkle on parmesan and/or asiago cheese. 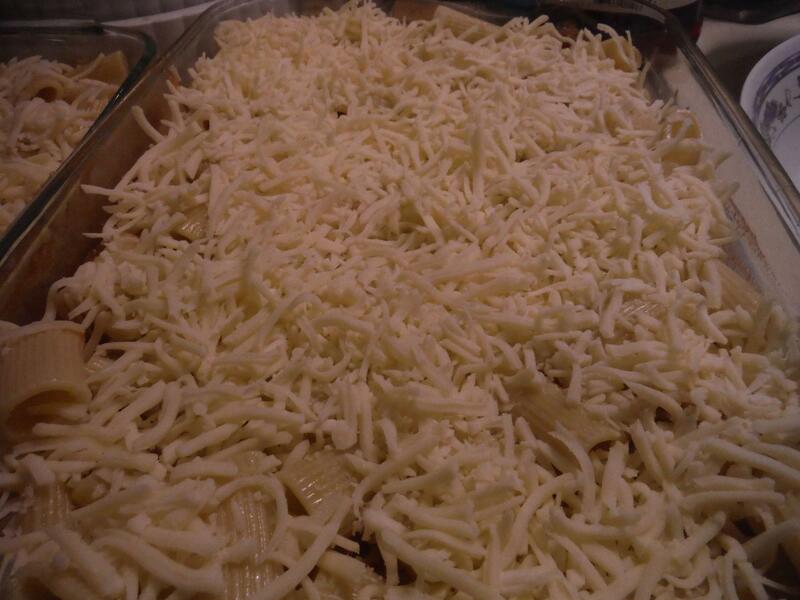 Add half of the pasta and cover with mozzarella cheese. Repeat last two steps, layering sauce, ricotta, parmesan and/or asiago, and pasta. 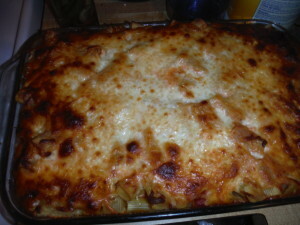 Top with mozzarella cheese and parmesan and/or asiago. 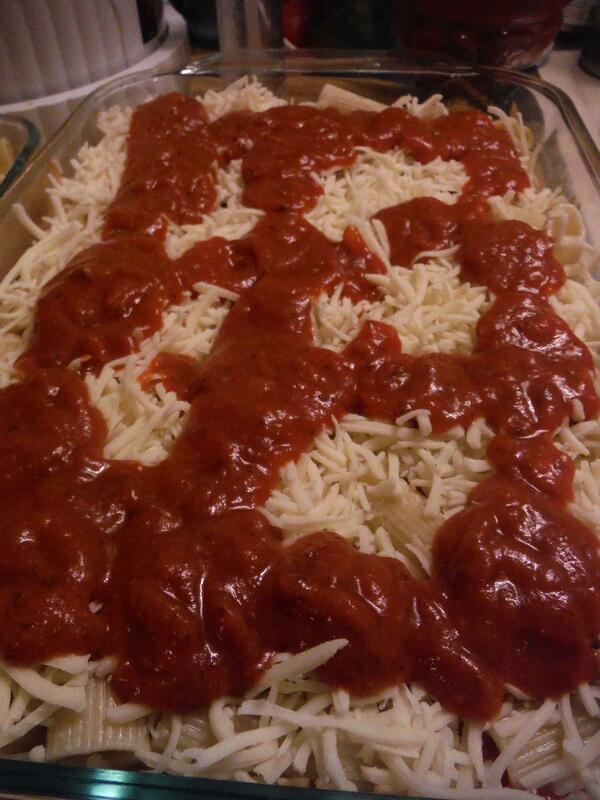 Place baking dish on a large baking sheet to catch any overflow and bake for 40-60 minutes or to your liking. For a crispier top, bake closer to 60 minutes. Serve hot with garlic bread with cheese. Enjoy!